Today however, my search bore fruit... I found IEs4Linux project, and its so damned simple. I am still running Hardy (not Interpid) on my desktop, and wine (the default). I picked up the instructions, kind of updated them myself to work in my hardy, and bingo.. it installed and works...absolutely. Within minutes, it automatically downloads some files from here and there, and is done. Further another view called all_source is also pretty useful if you have to look at the actual source code of a component. Finally... finally... after such a long wait.. iPhone comes to India.. officially. But, despite all the hype and wait around it, the affordability of it really a huge question mark. I didnt change my mobile phone for last 2 years, waiting for the iPhone to come to India. I booked an iPhone for me through both the prospective service providers in India, Airtel and Vodafone. It was all in anticipation that once its released in India, there would be huge queues for buying it, as was seen in other parts of world for iPhone 3G release. However, the launch in India was not as expected. There was hype, but not as many customers. I am not a statistician and therefore cant give any numbers to prove my point, but I guess I have a feeling for the situation. There would be people buying it, but not like me, not the average Indian IT guy, who knows the features, their meaning and usage and has a wish to own one. I dont know many who'd take up the phone at this price tag. Recently I was asked about strategy on data warehouse testing. Realizing how rarely we talk about this, I went to google for this and spend about half an hour searching. Found the following links, which still need to be researched/analyzed further. DM Review : Where are the Articles on Data Warehouse Testing and Validation Strategy? Caching is an important facet of lookup transformation planning. You need to know what kind of data you are dealing with, how frequently do you call the lookup, how frequently does the data change, what is the size of your lookup table etc. among other things. Once you use cache, the trip to database can be avoided, thereby enhancing performance. Different types of caches can be used with lookup like static, dynamic, persistent, and shared(The dynamic cache cannot be used while creating an un-connected lookup). Each of these has its own identification. For more details, refer to Informatica Transformation Guide. Lookup is a passive transformation, and can be used either connected or unconnected. Typically, connected lookup is used when you want to do the lookup for all rows. When you have selective lookup requirements, its normally better to go for unconnected lookup. Unconnected Lookup can be used as if its a function call. Had trouble originally making vmware work on my new hardy 64 bit system (behaves almost same on desktop and server variants). vmware on hardy 64 bit requires some tweaking to do before you can really get up and running with it. I tried to install a 64bit guest os and that took much longer to realize the problem. Also, you need to switch on the VT feature from your bios to be able to actually use 64 bit guest os.. My Core2Duo supported that, so luckily I had it already with my hardware. But if you want to do that, make sure ur cpu supports it. .img files are CloneCD files created as a result of dumping contents of a Cd into a file. Very similar to .iso files which are more popular for containing cd images. Many tools, like virtual box allow mounting .iso files as a virtual cd/dvd. Ubuntu repositories provide a tool called ccd2iso for converting the .img to .iso. This will create the iso equivalent of the img file. Ubuntu is by far the more stable of the OS's.. nothing new about that. Last friday the release candidate of the new Hardy came out. It was beta for sometime now, and I had it for a few days in beta phase too.. It was my first time playing around with an OS in its beta stage and sure.. it feels good to be involved.. In my view, the Ubuntu series has had its share of issues with hardware compatibility. With different people using different set of hardware, it turns out that not everything is 100% picked up by the installer as it should be. In the *nix operating systems, the tree style of file systems are there from time immemorial. In fact the idea of a inverted tree directory system or all filesystems originated with Unix. Here's a summary of the standard directories found on a typical Unix/Linux system. Current reference being Ubuntu. /etc/rc.d/rc*.d - where “*'’ is a number corresponding to the default run level. Contains files for services to be started and stopped at that run level. On rpm-based systems, these files are symbolic links to the initialization scripts themselves, which are in /etc/rc.d/init.d. /etc/skel - directory containing several example or skeleton initialization shells. Often contains subdirectories and files used to populate a new user’s home directory. /media - mounted (or loaded) devices such as cdroms, digital cameras, etc. /var - mainly logs, databases, etc. /usr/local/bin - the place to put your own programs. They will not be overwritten with upgrades. A very very useful tip. In firefox its possible to make shortcuts for your favourite links (especially useful for searches etc). For example, for a typical google image search, you would normally open images.google.com and then type in your required phrase and press search. That constitutes two trips to google image server to accomplish your search needs. With this method from firefox, you can achieve this in one trip to server, just by doing a small trick with your favourites configuration. You add a particular url to your favourites list. And later on, from the organize favourites dialog, assign that url a shortcut, a very small phrase e.g. img or images or something that you like. The reasoning explained sounds logical. Apparantly (as one of the article also explains), the restriction helps a user fill another user's quota by creating a huge file and chowning it to the other user. Even worse, if the other user doesnt have privs to access the dir hosting that huge file, he cant even delete that. When it comes to buying a wireless router, the acronyms can be misleading and confusing at times. Wireless Router FAQ - What is the Range of a Typical Wi-Fi LAN? BigAdmin Feature Article: Using Service Management Facility (SMF) in the Solaris 10 OS: A Quick Example: "Introduction"
For a given service, in an SMF manifest, you can invoke any script using the "exec" thing. That works for normal programs. You can also provide environment to the executable by adding sub-tags envvar.. However, For a network daemon based service, it wont work as nice as it does for other programs. I came to understand that programs that run as streams need to be designed to work that way specifically, you cant just make ANY program run as a stream through an SMF service. Startup article about SMF usage..
O'Reilly Network -- Using Solaris SMF: "In most Unix environments, the startup process consists of a handful of autonomous boot scripts। They act independently of one another; unaware of what scripts have already run or which ones will run after them. When they are invoked, there is no serious error checking and no recourse if the script fails." I have used this time tracking tool in past also, and always find it handy to keep notes in this format. Helps keep focus. Surprised to see that people are running independent project to make linux look/act like mac. I am curious and would sure experiment with this. Now expand "desktop" and then "gnome", scroll down to "volume manager" but don't expand it, just click on it and look over at the right pane. Scroll down and look for "autoplay_dvd_command" and change the command to "/usr/bin/vlc dvd://" (without quotes of course) by right clicking on it and selecting "Edit", then click on "Set as Default". Do the same for the "autoplay_vcd_command" as well. It works, finally... it works. I managed to configure my voipcheap account to work with Ekiga. Though the phone numbers that u have to call look a bit awkward (sip:<phoneNumber>@sip.voipcheap.com), but it works. Very useful piece of information about the changes from rails 1.x to 2.x. Since I was following the Agile ... with rails book (which is on rails 1.2.3), I got trapped with this problem. Few new things for me, the concept of Cross-site request forgery and that rails 2 already handles it in the framework. I got to this article through www.railsforum.com and I have to say I am impressed. Providing such useful features built inside the app framework is really intuitive. Very useful information for beginners... Or for troubleshooting the installation steps..
An online document viewing website, you upload your document, the world sees it. To me, an equivalent of blog, only not in terms of putting up content, rather organized documents. I got this Gartner group report about Magic quadrant Data Warehouse technology. I wanted to print it so that I can read it at leisure, but the pdf was locked for printing, even for copying. I googled for "unlock pdf files" and the first hit I got was this link. Just give it your locked pdf file and it generates an unlocked pdf for you in the new browser window. Its a bit different from wikipedia (media wiki) and therefore, one might have to carefully look at the formatting tricks and tips. It was my first weekend after I started working on my domain name and website. The last I was doing something with web technologies was like a few years back. Kinda nostalgic in that sense. There are many new technologies coming around the place, and sometimes I feel left out. When I started digging this time around, I got to know a few more things. Trac - SCM engine , used for bug tracking etc. Intro to Capistrano - the magical deployment tool from rails framework. Some documentation from my hosting people also on integrating capistrano. Got some hosting services from www.railsplayground.net people. Still waiting on the activation mail, with dns servers info and all that. I've always wondered why and how these people at ubuntu core group chose such names. Well, its hard to say that the names are good or bad, most of the times such word mean something or other in some or other language, for sure. Still, if there was some scheme behind naming the versions, I didnt know about it. Found this interesting page... I am pretty sure there are other sites and pages talking about similar stuff. Have been struggling with a slow db query on our Oracle 9i repository. There are product installations (redwood) and therefore the views provided by them cant be modified (read optimized). We found out through tracing etc that the optimizer is behaving strangely. Its choosing an explain plan that is not completely optimal. There's something funny with statistics as well, since when I rewrote the query to use the rule based optimizer, the query was finishing much much faster. I myself was thinking about this since a few days..Actually ever since I got my Gutsy freshend up I was wondering if I could move all my daily works stuff from windows to Linux. Photo management is surely one big area, especially with my interest in photos. And then today morning, just by luck, I found this page..
Not read completely through it, but the Ubuntu forum page it refers to is sure useful. I was talking to this friend of mine who moved his website from blogspot to wordpress. Wordpress have nicer templates, some really cute. Also, since my blog's url contains .blogspot.com, its hard for me to switch anyway. However, there is an easier solution for this url issue. Build a blog in wordpress, and start publishing that url. To make sure all who come and hit the old url, just enter this line in the <head> tag of the old blog page's html code. thanks google for allowing to find stuff so easily... I knew that it exists, but syntax would have been hard to figure out. I dont use Ubuntu as a full time desktop system. More focus on programming, though the general usage is increasing by day. While I was searching for something about one the gutsy issues I was facing, I came across this post. Really interesting set of suggestions from people who use such a system for everyday usage. Though personal preferences differ, its a good start. 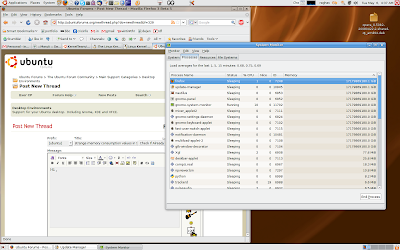 Trying to get my browsers run some online media streaming on Ubuntu. This page here is an excellent place to start with. Great compilation, and once again, the value of discussions forums is enhanced in my view. Going through a few Ubuntu forums, it turned out that many of the initial glitches around Gutsy installation for HP6710b have been removed. My installation was originally an upgrade from Feisty, a very troubled and hacked one at that. So, I thought why not try to give it a clean shot and get a fresh copy of Gutsy installed on my laptop. Though I had to spend some time to configure a few things again from scratch, it looks and works like a much better system than it used to. After my fresh installation, I had initial trouble with installing rails. There this page helped. Though it talks about installation on FreeBsd, it worked perfectly on my Gutsy. Then I had some trouble with initial password of root user on MySQL. For some reason, after the initial installation, I could not go in mysql environment through any means at all. Then again, googling and ubuntu forums helped out. This page helped me through that. Finally, when I was installing Eclipse to be able to work faster/better with rails, I came across the fact that the standard Eclipse package from Ubuntu, does not come with any java runtime environment. I tried downloading and using Sun Java but that didnt turn out very well. Later I found that Synaptics has a cunning little feature. On a right click on a package name, there is a option for "Mark Recommended For Installation". Once I clicked on that, it selected about 15 more packages and this time managed to get all the required stuff for Java as well. For some time now, I was looking for the right kind of IDE to work with ruby on rails. Googling for this helped but not much. Eventually, I came across this post somewhere which mentioned RadRails. This is a module from Aptana development studio. In addition to the fact that this is a component of the Aptana dev suite, this component is available separately as a plugin for Eclipse as well. And installation and configuration come very very simple. In a running version of Eclipse (I have Eclipse 3.2), look for a remote installation site. Few simple questions about which package to install etc. and you have the plug-in installed. And it works like a charm, really. After installation, you can create a new rails project from within Eclipse GUI as well, in addition to your favourite command line methods. Starting a server, generating components (controller, model etc..), its all possible from the GUI. I personally like the GUI and the syntax highlighting the most. I was just checking Firefox 3 beta 3 today, when I found about this new browser called Flock. The browser provides amazing functionality for different sites built right in. Many a tasks you would have done manually are now completely automated, thanks to new browser functionality. Powered by Mozilla, I found it to be a very interesting browser option against Firefox. Hey... Informatica have launched a brand new set of discussion forums on their website. This url should normally point to the overview . I have a good feeling about this, the company hosting its own discussion forums. Before this there were some yahoo groups that acted as discussion forums for the company, and some developer network forums. Got hands dirty with quite a few things in and around RoR. Started with building the demo application with projects and tasks.. and as the iterative model says, kept adding to it. By the time I realized, I covered quite a few basic concepts of Rails. And, I hope to make some progress on my LMS project as well. Here's my collection of useful URLs from today's session. I was revisiting my rails know-how and planned to start a new project. But couldnt really get a solution out. thing. He referred to this link. HP website's support ticket management can be improved. However, it took few more days for them to acknowledge the real problem. Then they picked up the laptop and returned it after 9 days with a replaced motherboard. I am happy to say that the exhaust fan now works without the special sound it was creating earlier. In November I encountered for the first time something I would call a "problem". The exhaust fan just wont stop whirring... and that too at a pretty high volume. As a result I had to start looking for stuff on net..about others having similar issues... As it turned out, a lot of other people were having the same problems. In the meantime, HP has acknowledged the problem and starting fixing the issue by replacing the motherboard in the laptop with a new one (apparantly at no cost to customer, but I cant guarantee that since I have a 4 year hp care pack). So, now a days, my notebook is with HP for the motherboard replacement. Read here more about the famous "noisy fan" problem with 6510b/6710b notebooks from HP.